"The best informed book that has yet been produced on Rhodesia-Zimbabwe." Michael Hartnack, reviewing So Far and No Further! Welcome to the website of Dr JRT Wood, one of the leading historians of Rhodesia and Zimbabwe. This site is intended as a window onto Dr Wood's world and as a resource for scholars. If you have any feedback about the website, please contact us. Thank you for visiting! May 2009: Counter-Strike: from the Sky, Dr Wood's examination of the Rhodesian security forces' famous Fireforce counter-insurgency unit, is now available. 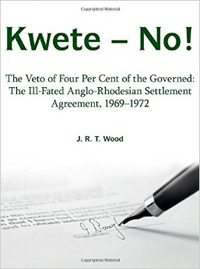 May 2008: A Matter of Weeks Rather than Months, Dr Wood's third definitive history of post-WW2 Rhodesia/Zimbabwe, is now available. Michael Hartnack's review of So Far and No Further! is available online now. So Far and No Further! Rhodesia's Bid for Independence during the Retreat from Empire 1959-1965 is now available for sale in South African bookshops courtesy of 30º South Publishers. International customers may prefer to buy from Amazon.com or Trafford.com. View the web's most comprehensive bibliography of books about the history of Rhodesia and Zimbabwe - a must for scholars.